Series 10 has begun filming. Of course this means it’s this time of year we scavenge the internet for shaky camera footage of onset filming; speculating far-fetched fan theories that will come into light in Spring 2017. Yes, it’s going to be a long year for us Whovians. However, it has been confirmed that we will see a familiar face in the form of Missy who will return next series. So what will Missy have in store next year? Last time we saw Missy at the end of The Witch’s Familiar. It was made ambiguous what happened to her at the end of the episode after saying “I have a very clever idea” when cornered by a group of Daleks. Could this mean another Master alliance? It seems plausible as frequently in the classic series the Master would team up with the Doctor’s foes in many stories. One that springs to mind is the Master and the Daleks in Frontier in Space which reflects what could possibly be her new alliance. Many would think after the events of this she would have formed an alliance with the Daleks. As plausible as that seems the Daleks desperately need a break from the show and not another full story so they don’t become too repetitive. For Series 10 I hope Missy to have a bigger threat in an episode. In my opinion I disliked her motives in Series 8 but enjoyed her part in Series 9 as a side role. Her motives in Death in Heaven by giving the Doctor an army didn’t really sit right with me and seemed quite pointless. In Series 9 it seemed she was more than just your typical villain and could be part of the episode just as much as the companion. Next year I hope they up her game and show the power she really has. Perhaps she could have a part in the finale with an alliance from another threat. It’s more likely for Missy to turn up in the last story of the series as it seems quite fitting for Moffat’s final finale. She also returned in Series 9’s opener so it seems unlikely she will appear the same way. Undoubtedly the confirmation of Missy returning wouldn’t have surprised many of us. Seeing as it’s Steven Moffat’s last series as head writer it isn’t a shock to see his Master appear again. To be honest I’m looking forward to seeing Missy again. When first seeing her Master is Dark Water/Death in Heaven I thought she was the ideal choice to play the role. 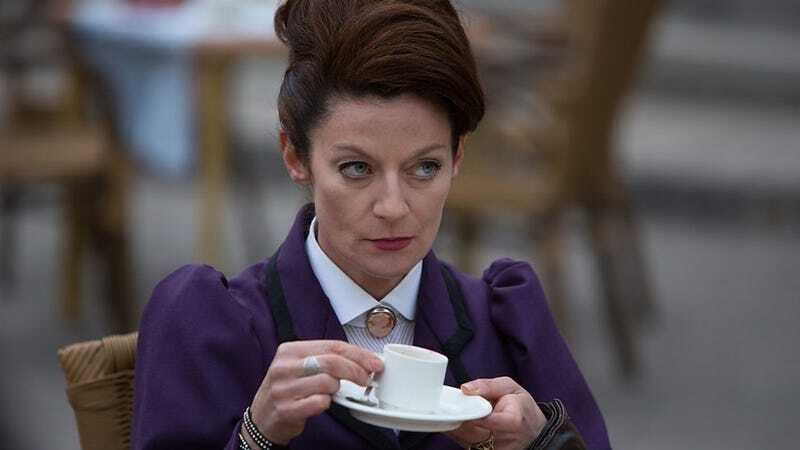 Michelle Gomez is captivating on screen and is one of the best people to play the Master we’ve had. However, I found her character to be too flirtatious like many female characters written my Steven Moffat which I thought the Master should never be. When she reappeared in Series 9 I thought her Master improved massively and became one of my favourite actors to play the role. I hope this continues for more of her future appearances. So how can we move on Missy’s character? Like I said earlier we can show Missy as a true threat to the Doctor. We can show Missy truly ruthless and show even more of her undeniable insanity. For Series 10 I hope the episode has high stakes with her character and even a threat to the lives of other characters including Bill. I hope there will be a new and original threat for Series 10 instead of repeating the same villains for each finale or series arc. I think the show needs to gain more originality. What I love about Moffat earlier series (even if they weren’t resolved very well) is his original ideas. The cracks in time, the Silence really made the show feel like if was moving forward and building the show’s universe more. I think it would be great to include Missy into the plot of this for Moffat’s final finale along with a new threat. Of course Series 10 will see the next companion which will see a big change for Doctor Who and a new Doctor and companion dynamic. Personally I’m looking forward to how Missy will react to Bill and if it will differ from Missy and Clara in The Magician’s Apprentice/The Witch’s Familiar. Missy also remembers Clara which the Doctor doesn’t after his memory was wiped after the events of Hell Bent (which I wish happened to me after seeing that particular episode). I hope they don’t focus to much on this because we’ve seen and mentioned Clara so much in the show I think it’s time to move away from it and to focus more on Bill. Could this be Missy’s finale appearance in a series? As Chris Chibnall’s era will be labelled “a new start” it would seem Moffat’s version of the Master may be her final appearance and a new Master may take her place in years to come. Personally I would love to see more of her Master in more stories. For me she could even be as good as Rodger Delgado or John Simm if she is written at a better level or if she will appear in more episodes. In my opinion it seems likely this will be her final series but who knows? To conclude I think Missy will be a brilliant addition to the tenth series. Ideally for her to be a greater threat next year but not much in the spotlight for more original villains to take the stage. If this is likely or not let’s hope the wait for Spring 2017 will be worth it. Leave your comments below what you are looking forward to Missy in Series 10 and what you think we will see from her Spring next year.